The massive lineup of after-parties for the BUKU Music & Art Project is proof positive that New Orleans is the perfect backdrop for the festival. Sure, New York can share a claim to be the “city that never sleeps”. But New Orleans has no peer on this side of the Atlantic when it comes to the “city that never stops partying”. 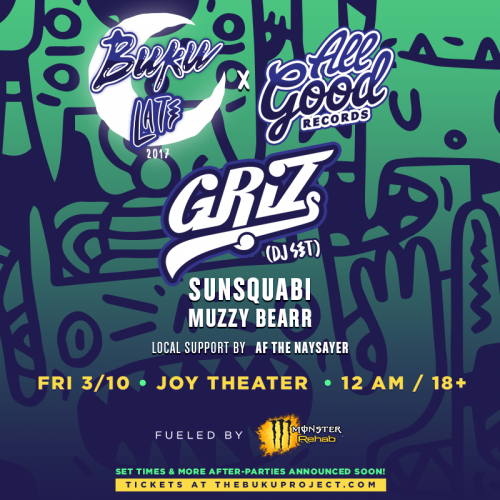 BUKU LATE x All Good Records: ft. GRiZ (DJ Set) + more! The Joy Theater, the venue for this after-party, is a versatile spot featuring a standing room floor and a seated balcony area. This show is ideal for fans who don’t want to stray too far from New Orleans’s bread and butter – jazz, funk, and blues. Don’t forget your dancing shoes, either. The high-energy lineup almost requires the crowd to groove. Expect some unbounded synergy for this show. To get a feel for GRiZ’s sound, check out “Rather Be Free” from his latest release Good Will Prevail (2016). The track is a collaboration featuring Muzzy Bearr, another artist in the after-party lineup. We can only describe this track as something reminiscent of a high-energy Black Keys song where digitally charged drops replace the hooks. BUKU LATE ft. Zeds Dead + more! An absolute staple in New Orleans’ electronic music scene, Republic NOLA is the perfect venue to host a BUKU LATE party. No matter the occasion, the crowd at any show hosted by Republic is ready to keep the party going ‘til the sun rises. Atop this roster of heavy-hitters, Zeds Dead will certainly tear the roof off of Republic and blowing away the expectations of every attendee in the process. Feeding off the residual energy from their BUKU set earlier in the night, fans can expect this set to be nothing short of unstoppable, explosive, and monstrous–what Zeds Dead does best. Hoisted upon the admirable Techno Club brand, Walter Jones will perform for this intimate crowd. 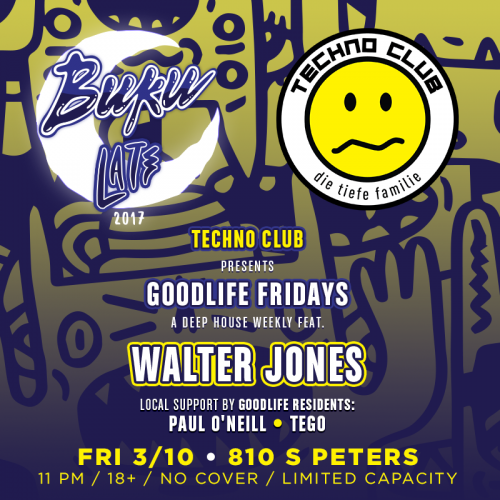 Unique to “Goodlife Fridays,” this after-party has no cover charge, but with limited capacity will hold a certain exclusivity, and targets a more diverse audience than any of its other BUKU LATE counterparts. Walter Jones has been producing music since the 70s. As is expected for an artist of his era, he brings an old-school, heavily disco-influenced sound that pays homage to the origins of house music. To get a feel for his style, listen to his epic 17-minute composition “All God’s Children”. Trust us; it’s more than worth the time commitment. 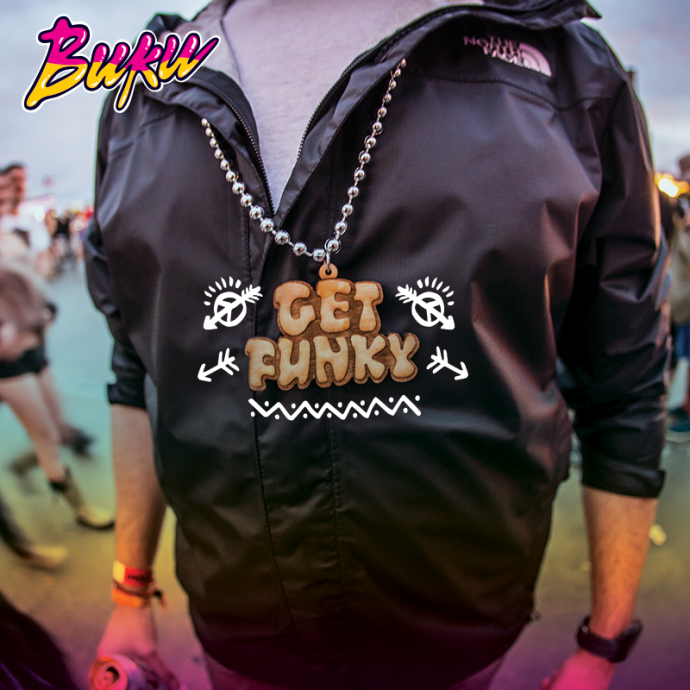 BUKU LATE ft. Gramatik + more! Gramatik, a member of Pretty Lights Music and founder of Lowtemp Records, brings his brand of innovative blend of dubstep/glitch-hop, live instrumentation, and hip-hop roots. Take a listen to the instrumental included below from his latest, “Epigram: Deluxe Edition,” and you’ll see what all the fuss is about. Another act not limited by genres, Ganja White Night is known for bringing their unparalleled energy to each and every performance. 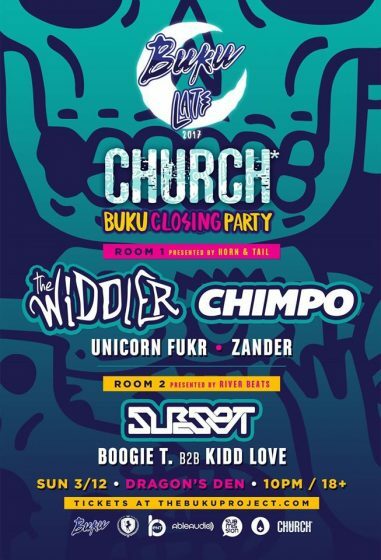 Along with newcomer josh pan and the powerhouse, festival-favorite, Space Jesus, this BUKU after-party won’t just ooze energy; it’ll blare that energy for all of New Orleans to hear. 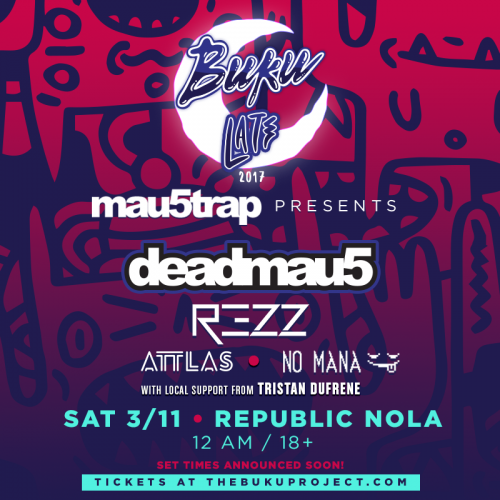 BUKU LATE x mau5trap ft. Deadmau5, REZZ + more! This late-breaking after-party came as a huge surprise to River Beats. But Deadmau5 needs no introduction. The legendary artist continues to tour, produce, and push the envelope while staying relevant as one of the top acts in electronic music. Recently, he made an entrance into techno music under the alias testpilot. Last week, he released “stuff i used to do”, a free album full of past unreleased works from 1998-2007. You can download the album via this link. You can check out a mini-mix of the tracks on “stuff i used to do” below just to hear for yourself how diverse this album’s sound is. Need we say more? This show is for fans that want to see the legendary Deadmau5, whether it’s the first time, second time, or tenth time. 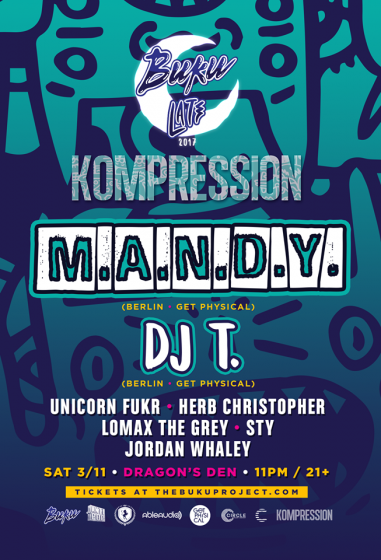 Brought to you by Horn & Tail, The Widdler, Chimpo, Unicorn Fukr, and Zander will all perform in Room 1. Meanwhile, River Beats presents Room 2 for bass-heavy artist Subset and a special b2b set from Boogie T and Kidd Love. River Beats has a detailed preview coming in soon. Stay tuned! All event images provided by BUKU Music + Art Project. 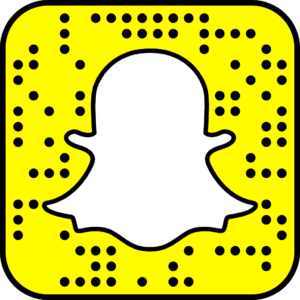 Staff writer Cam Woods contributed to this preview.